It happened without my consent or attention. I noticed it just a few nights ago. I was putting my little girls to bed, sitting on the edge of the bed scratching their backs, when it hit me, “Wow, I don’t hate this mosquito net anymore!” I had the same realization the other day when I threw away some old food and didn’t have the gut wrenching guilt that I had experienced in our first few months here. 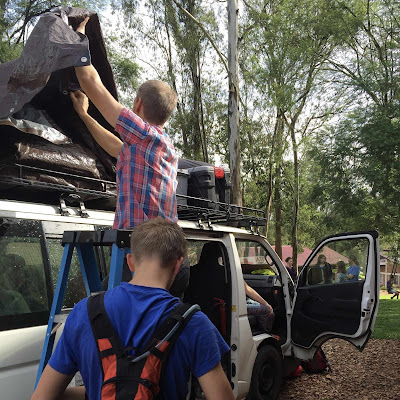 We have lived in Burundi now for 4 months. The transition has been more difficult for us than we anticipated and in ways that were unexpected….i.e. the trash and mosquito nets. Yet, life has ever…..so…..slowly found it’s new rhythm and patterns. Trash is no longer an issue of angst. 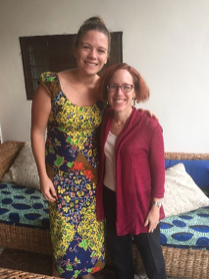 I was so worried about offending our Burundian househelper every time my kids didn’t eat all of the food on their plate, or when I would throw away a huge casserole that tasted bad from the very beginning. And the mosquito nets…ugh, they sound so fun right? Like a little tent for your kids, a safe little place for them to sleep. But oh no, they have a mind of their own. They grab your shoe, stick to the pillow, hang too low in some places…..it has been a pain. Yet, now, I can see their appeal and the safety that they offer. I actually wonder now if sleeping without them on furloughs will be an issue. Transition is a funny thing. I remember our first week here, life was so different for all of us that I didn’t have the time or ability to teach my kids how to brush their teeth without using tap water, so they didn’t. They didn’t even take a bath the first week. Every single one of your senses is overwhelmed each day and the only thing you can do is take one new reality at a time and deal with it. I pictured it like this. Our world was turned upside down with every single ball floating in space, and each day you grab one of those balls and tackle it. Day one, the food and water ball, What do we eat here, how do we want our water filter set up? How do we make COFFEE? Day two, trash/compost ball, what can we throw away in front of a Burundian, what needs to be done under cover of darkness? To me, it’s a very difficult thing to go through a major life transition like this with 7 kids following behind you. To tell yourself to only use filtered water is one thing, but to get all of your children to understand this, and do it, is an entirely different challenge. I know that our transitions are not done here, and maybe they never will be. Africa has a way of keeping you on your toes. But God has been gracious in this season. He meets us in our weak moments, in the times when buying a plane ticket to America sounds like the best idea EVER. Yet we keep staying, keep going to bed, waking up and taking on another day. And slowly a love for this life is growing. It’s just a seedling now, I’m not even sure if the sprout has come up above the ground, but it’s there. By God’s grace it’s growing and will one day be a plant…and then maybe even a tree. A tree of love for Burundi, for Africa, for serving the poorest of the poor in Jesus’ name. I would like to try to describe a ‘normal’ week of life in Kibuye but, there really isn’t such a thing. This week felt particularly abnormal. 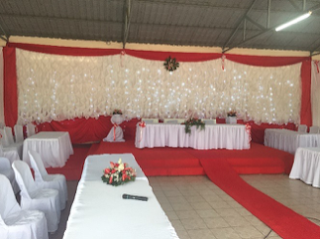 Over the weekend a group of us took the three-hour trek to Bujumbura to attend the wedding of one of Kibuye Hope Hospital’s Burundian doctors. I have had the privilege of attending many Burundian weddings in my year and a half here – I believe this was number seven but, it was my first in the city. It may have been quite a bit hotter than a village wedding, but it was quite a bit more extravagant to make up for it. Replacing the strands of paper often hung from the church ceilings for decoration, the walls were covered in billowing red and white fabric. The bridesmaids all wore modern matching red dresses, and the groom wore a white tuxedo. At the reception, the wall behind the couple was covered in fabric and twinkle lights, and there were white slips covering all the chairs. Some of my favorite bits of the wedding were when a group of girls followed the couples every move throughout the ceremony tossing copious amounts of confetti over them, the bride and groom each surprised each other with an original song which they performed at different points in the day, and as the car took the couple between locations a group of men from the wedding party walked next to and in front of the car resembling the secret service. We bowed out after formally presenting our gift so we could make it back to our friends’ house before dark. Nights in Bujumbura are usually filled with downloading, updating, and skyping. 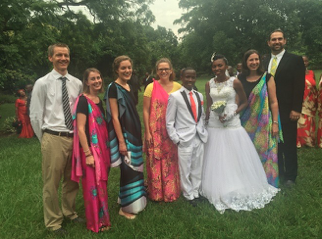 Back in Kibuye, on Monday afternoon we welcomed the first of the 27 (!!) total visitors that will be passing through Kibuye this week (as I said, this is not a normal week). One of these visitors happened to be the American Ambassador. As her caravan of three SUVs pulled up we all stood at attention at the front gate a bit nervously, prepared for a very formal welcome, only to be greeted by a few dozen hugs and smiles! She came on Thursday and stayed the night, giving us all a chance to share lunch at the hospital canteen, an informal ‘meet and greet’ / shamelessly ask for selfies, and of course a dessert social. I believe it was the first US Ambassador to visit Kibuye since 1989. Needless to say we were honored, and thankful for the work she is doing. WARNING — The following blog is a little gross. Read at your own risk. 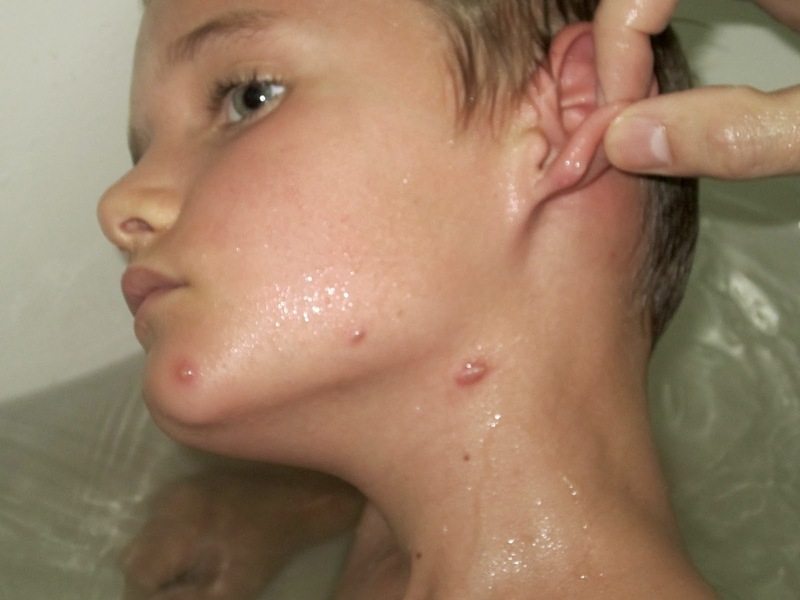 Our son (8) woke up a few mornings ago with about 15 mysterious bites on different parts of his body. We thought a mosquito or flea went to town on him at night. 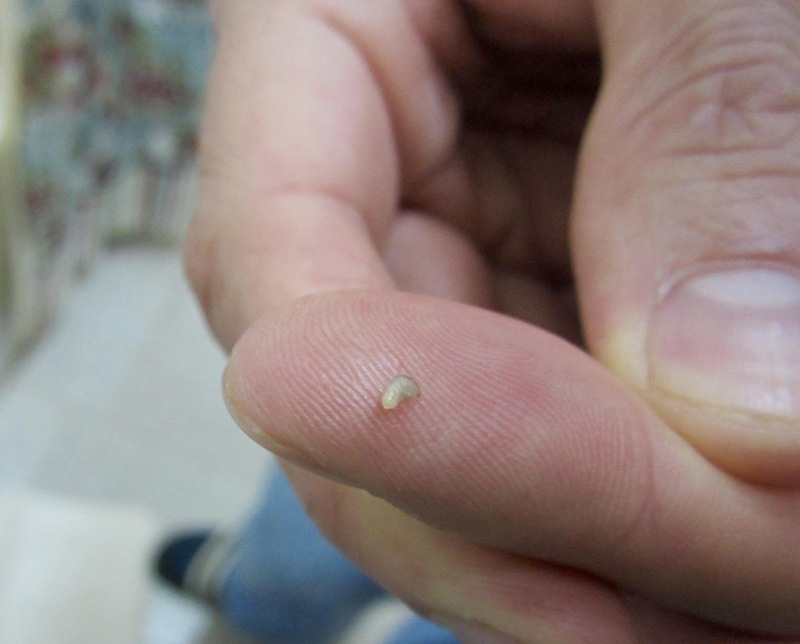 Bug bites of unknown origin are not an uncommon occurrence, so we didn’t think much of it. After a couple days we noticed that one of the “bites” had come to a white head with a black dot in the center and red lines streaking away from the center. Well, perhaps this is a jigger (although a very odd place for one) or an infected bug bite. We tried to give it a squeeze, but it was pretty painful and didn’t prove effective. We also noticed that some of Micah’s other bites looked infected as well, so we started him on some antibiotics. Nearly two days later, things weren’t really improving and he complained about them throughout the day. As recommended by our beloved & talented pediatrician Dr. Alyssa, we soaked him in a nice warm bath. It soon became clear that something alive was inside those “bites”. After letting him soak for about 15 minutes, we began the squeezing process. We lost count after a little while, but we think we removed around 17! One from his head, his ear, several from his face/neck, armpit, back, leg, etc. Poor kid was feeling pretty woozy by the end. It was traumatic for some and thrilling for others. Of course, we decided to look up some information online after we treated him and discovered that you’re not actually supposed to squeeze them out. (Note to self for a next time we hope never happens.) Apparently, petroleum jelly will suffocate them and you can then extract them with tweezers. Fortunately, I think the attempted drowning technique worked pretty well and they came out intact. This might go down in the Kibuye infestation record books. While I am competitive, that’s one record I hope no one else in our family (or on our team, for that matter) ever beats. We continue to be proud of Jason and beyond grateful for the support our work has been receiving. And as a team, we continue to pray God will use us here in Burundi, for many years to come.